Thycotic’s annual survey of participants at the February 2017 RSA Conference in San Francisco, revealed some startling and disturbing insights into the social network habits of security professionals (and likely their fellow employees). have never changed their social media passwords at all! Millions of employees using social media accounts represent a major workplace risk if/when those accounts are compromised. Once hacked, a social network account can easily provide access to information that gives hackers access to other facets of users’ lives, such as their work computers and email accounts. To make matters worse, large social networks don’t remind or make clear to users the risks associated with weak passwords, or never changing their passwords. In fact, new social network platforms allow for a single logon that is linked to multiple social media accounts so that users can avoid having to remember multiple passwords for multiple accounts. You’ll get important highlights from the RSA Survey key findings. You’ll get a great list of free, professional password security tools. You’ll learn details about the disconnect between security professionals and their own cybersecurity habits (and maybe some of yours too). You’ll get excellent recommendations on how you can protect your user and privileged account credentials by implementing proven password security best practices and using automated tools. 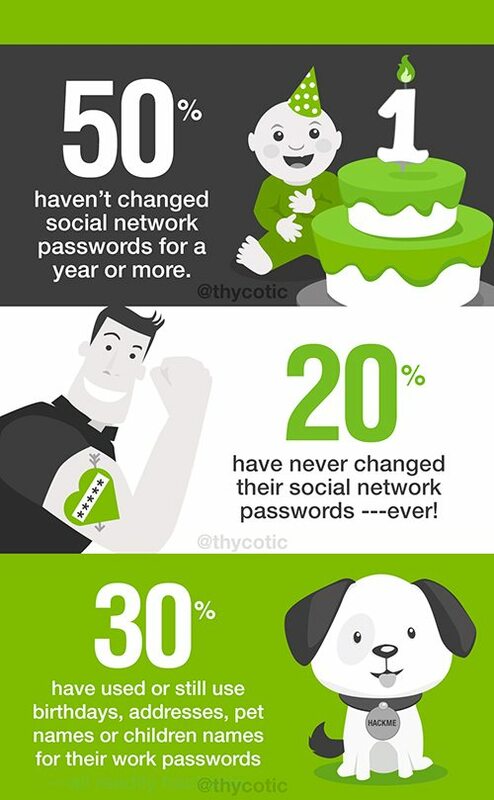 How strong are the passwords you are using? Thycotic’s Free online password checker lets you immediately determine the strength or weakness of any password in seconds.